The Deestone D838 lawn and garden bias ply tires feature a wide footprint to minimize soil compaction while providing exceptional grip. Their unique S-shaped tread blocks provide excellent traction as well as stability. The optimized block size and depth minimizes turf damage. S-shaped sipes on the tread blocks provide added grip and minimize irregular wear to improve durability. 23/9.50--12 N/A 1,570 lbs 30 psi 10/32nds 9" 9" N/A 23"
Purchase includes the Deestone D838 tire only. The wheel rim shown in the picture is not included. Picture provided is a stock picture from the manufacturer and may or may not reflect the actual product being ordered. 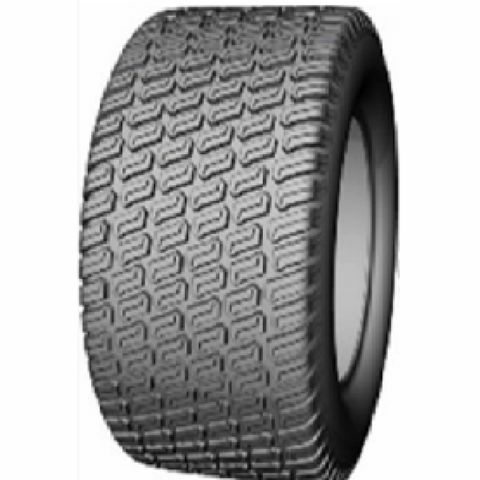 All Deestone D838 tires are continuously developing with manufactured improvements. With that said, Simple Tire and the manufacturers have the right to change these tire specifications at any time without notice or obligation. Please Note: Specifications of the Deestone D838 tires shown above are listed to be as accurate as possible based on the information provided to us by Deestone tires. I purchased these tires for a small loader for my tree and landscaping business to minimize damage to lawns. I am very happy with the ability of these tires to handle heavy loads. They have not caused any ruts or turf damage. I have had them for 3 months and so far am very pleased. I would purchase again. Great tire for Scag mower, lots of traction! Smaller than original tire though same tire dimensions on sidewall. Mounted just fine. Just adjust deck if there is blade height difference. By submitting a review, each person received a sweepstakes entry. Excellent tires, heavy-duty tire for the price. I'm extremely impressed with these tires !